↑ 4,04,14,2 Gascoigne, Bamber. 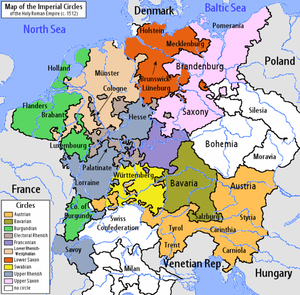 "History of the Holy Roman Empire", en HistoryWorld. ↑ 12,012,1 Barraclough, Geoffrey (1984). The Origins of Modern Germany. New York: W. W. Norton & Co. Inc. pp. 101–134. ISBN 978-0393301533. ↑ 13,013,113,213,3 Barraclough, Geoffrey (1984). The Origins of Modern Germany. New York: W. W. Norton & Co. Inc. p. 109. ISBN 978-0393301533.